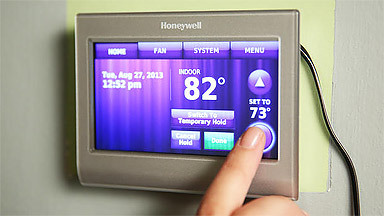 Many of us have been in the predicament of having our air conditioner break down in the summer months. When you call a repairman to come quickly, you soon realize summer is peak demand for air conditioning repair, and you may find yourself waiting in line. Don't panic if this happens to you. Follow some simple steps to help quickly cool off your space when the heat threatens to take over. Get the fans going. If you have a ceiling fan, make sure it's going in the direction that air is blowing downward to create a breeze. Fans don't work to bring the temp down in a room, just the people who are in the vicinity of the air flow During the evening, put fans in open windows to bring the night's cooler air inside. Run your attic fan during the night to circulate air inside and keep things cool. Turn the attic fan off and shut windows in the morning to trap the cooler air inside instead of losing it. South- and west-facing rooms are the hardest parts of the house to cool because of the hot sunlight exposure. Cover your windows by closing blinds, drapes or putting up blankets to block the sun from coming into windows and filling the room with heat. Thick drapes with white backing are the best for keeping out the sun and the room cooler. Ice is your friend when the house is heating up. Pour yourself a large glass of ice water to stay cool. Place blocks of ice on baking sheets or in casserole dishes and set in front of a fan to help cool off a room. Fill an ice chest and leave the lid open to draw cool air into a room. While your air conditioning is down, refrain from using heat-generating applicances indoors such as the dishwasher, dryer, stove, oven, and even the microwave. If you must use these things, wait until dark when the air is cooler and can be circulated from outdoors to indoors through open windows and fans. If your air conditioning unit is over 10 years old and the repair bill is over $500, you might consider it time to replace your air conditioning with a new energy-efficient unit. This will save on your bills and pay for itself in the long run. Plus, you will save your family the duress of no cool air during the blistering days of summer. Look for the ENERGYSTAR sticker for the best selection.